Mention Vietnam and the majority of people’s minds will drift towards the ‘American War’ as the Vietnamese call it. Vietnam versus the US, communism versus capitalism. As we travelled south through Vietnam, we were reminded of the war along our journey. From the demilitarised zone near the old capital of Hue in Vietnam, the atrocious impact of the war spilling over the borders into neighbouring Laos and Cambodia, and the after affects of unexploded ordinances (UXOs) we wrote about in The bombs of Laos. 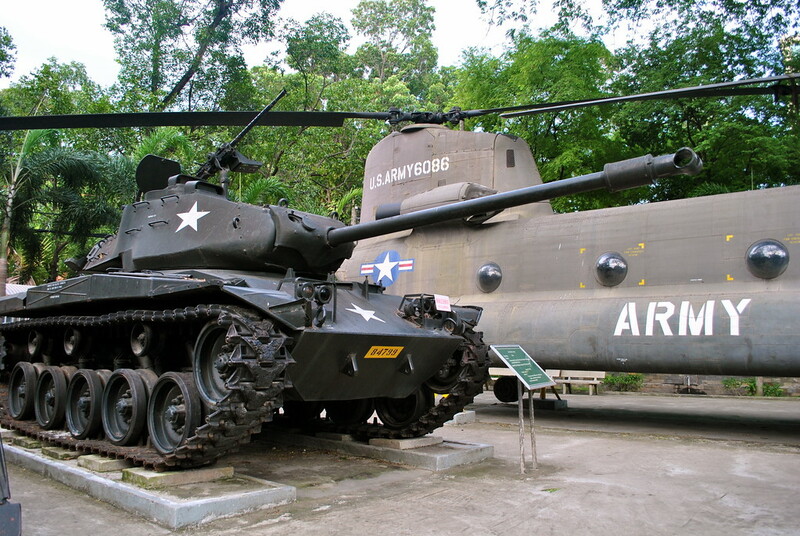 The War Remnants Museum in Ho Chi Minh City (HCMC) is a no holds barred account of the war from the Vietnamese point of view. The images are graphic, the video clips horrific and the accounts of those who experienced it harrowing to read. The museum puts a heavy emphasis on imagery, including the stories behind the photographers, the majority of whom perished in the war. Photo evidence of the after affects of agent orange and napalm are also evident, with shocking photos of deformed foetuses and children. Some have called the museum propaganda, and whilst the language used is aggressive, as outsiders to the war we saw it as a strong and graphic account of the terrible events of those years in a country ripped apart by conflict. Without wanting to wade into controversy, we found the museum very useful to understand the main points of the Vietnamese point of view regarding the war. It was also interesting to track the subsequent impact on the US political system, its relationship with the media and the transparency of war. We’d absolutely recommend a visit to the museum, but be prepared to be shocked by some of the imagery. 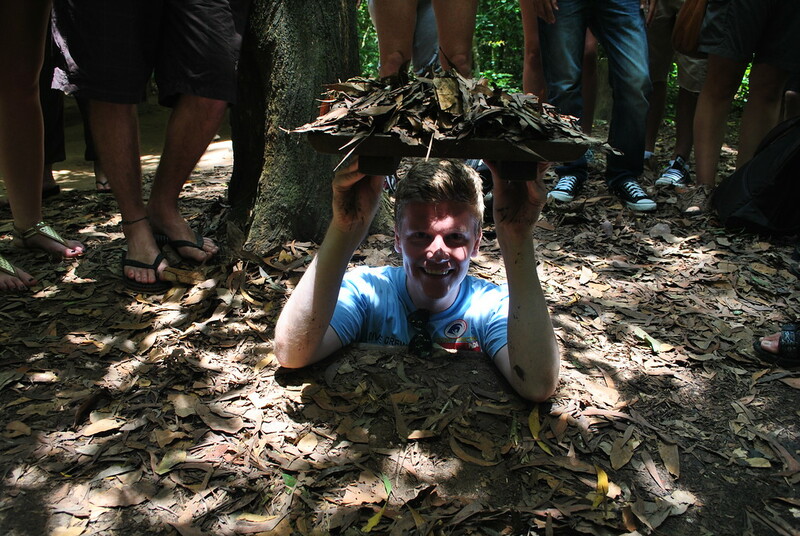 We also visited the Cu Chi tunnels, a couple of hours from the centre of Ho Chi Minh City. 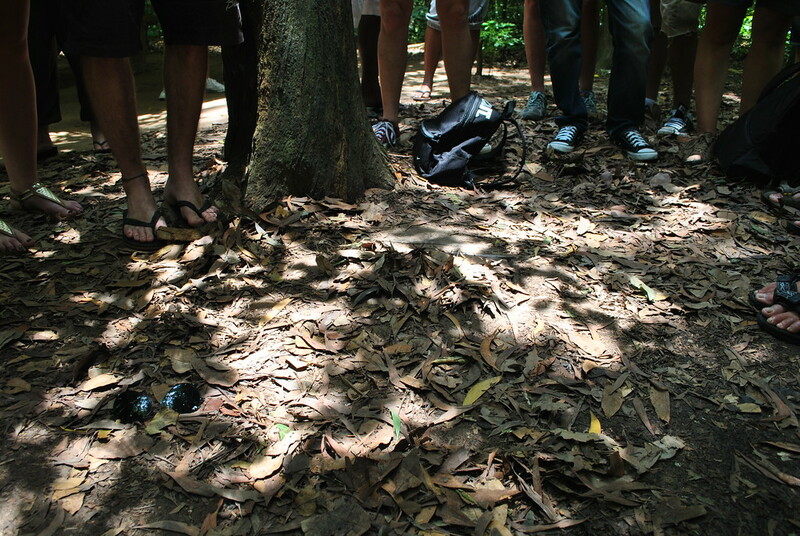 This was an area where the Viet Cong were in their element. An elaborate system of underground tunnels allowed the Viet Cong to move around undetected, moving underneath US forces, disappearing from view and appearing later behind the enemy, ambushing them. 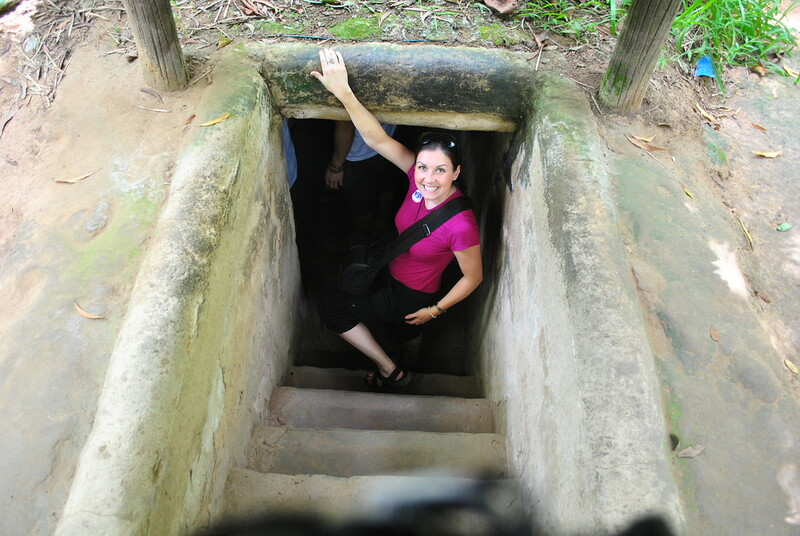 A small section of the tunnels have been restored here, and you have the opportunity to experience a part of what it was like for the Viet Cong. As you can imagine, conditions were atrocious. It is estimated at any given time half of the troops would have had malaria and almost 100% would have some form of ‘intestinal parasites of significance’. The tunnel we experienced had been enlarged, but as we descended the steps into the tunnel, a dizzying feeling of claustrophobia swept over us. 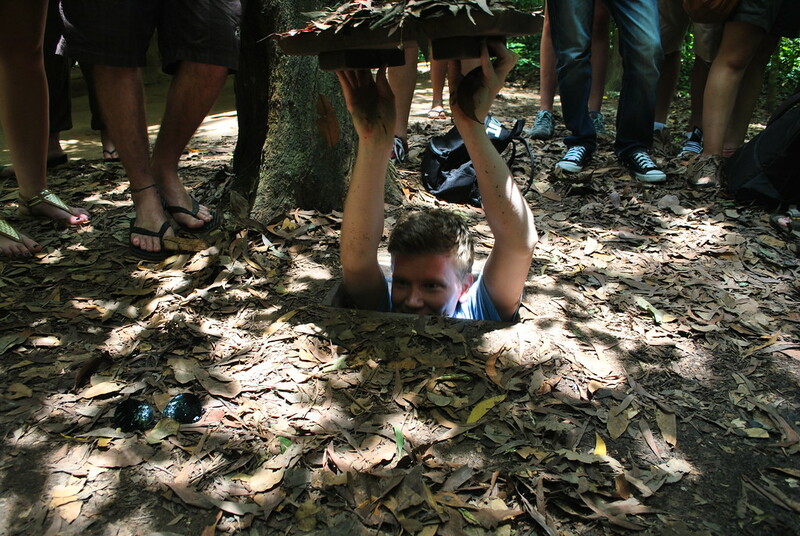 Imagine crouching inside a tunnel around a metre in height and you get a sense of what the Viet Cong experienced. It was dark and damp and the goal was to walk 100 metres underground. As we entered the tunnel, we knew instantly we wouldn’t make it to the end. Knowing there are exits every 20 metres was reassuring, and Laura and I bailed out at 40 metres. We probably could have gone further, but we’d seen enough. It is genuinely unimaginable having to live down there for months, and fight a guerilla war at the same time. 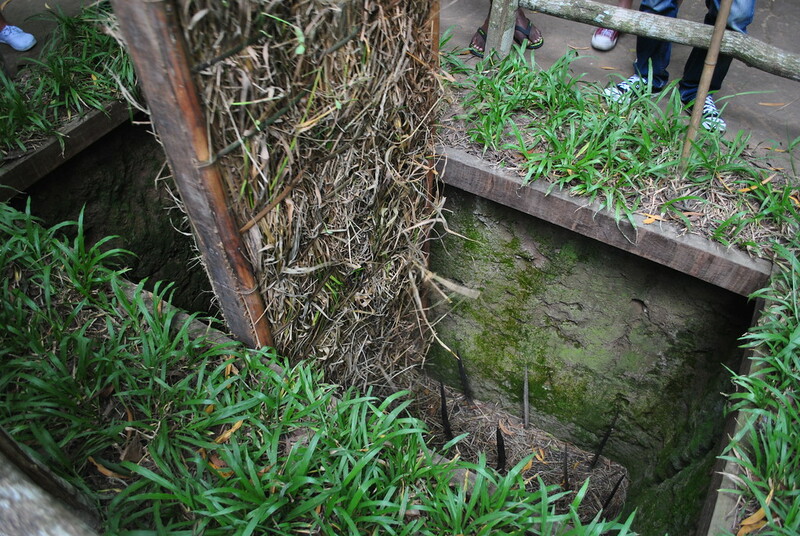 We also saw some of the other methods they used to kill and maim the enemy, including spike pits. The war was a horrific drain on all sides involved, and visiting these two sites gives you a real feel of both the horror of war, and the extraordinary lengths the Vietnamese went to to achieve success. For anyone visiting Vietnam, these resources are a must see to fully understand and appreciate the horror that took place here in the not too distant past. For more Vietnam inspiration, check out our other articles here. 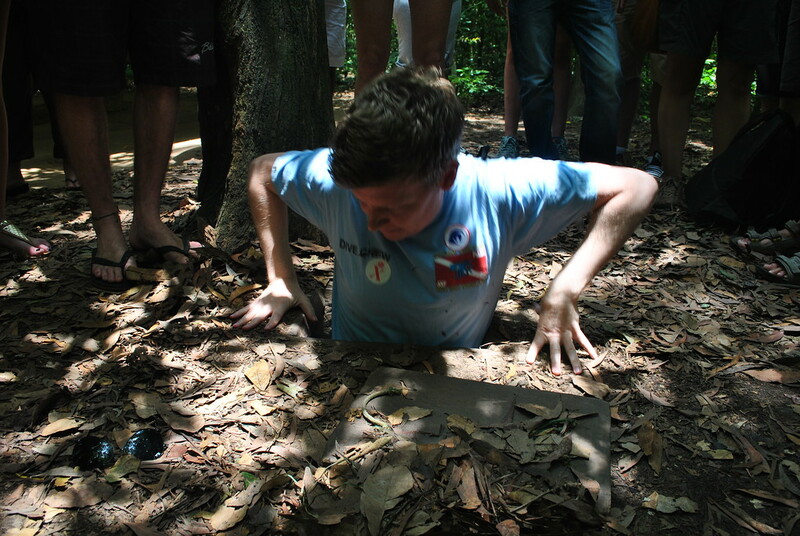 Wow the cu chi tunnels looks absolutely insane. Definitely looking forward to checking them out and the war museum in Ho Chi Minh. We just went to the revolution and war museum in Hanoi and are looking forward to learning even more about the Vietnamese history and the war in Ho Chi Ming. We’d be interested to hear if you make it all the way through the tunnel Vicky! We would definitely recommend at least half a day in the museum, perhaps a day if you have time! It’s so interesting to see history from other countries’ perspectives. I can’t believe people lived in these conditions for so long – I would definitely get claustrophobic in that tunnel too. It was a real eye opener for us Anna, especially the lack of censorship of images or diluting of opinion. It was very claustrophobic in those tunnels! Looks very interesting. But I’m still rather surprised at how someone could visit that place and be able to bare such a smile on their face as the girl in the picture does. It was interesting Ryan, and to be fair that’s a nervous (I’m a bit scared about this) smile for the camera rather than a ‘happy smile’ if you know what I mean. Still, I take your point that someone smiling or posing in delicate, historical places can give the wrong impression. Believe me when I say we try and act appropriately wherever we are, we’ve seen too many travellers disrespect sites by joking around, laughing and generally being unaware of the inappropriateness of their behaviour. Thanks for commenting. Thanks for stopping by, hope you’re enjoying Vietnam! Regarding the fairy springs, see if you can go yourselves – we went with a group and there were loads of us there at the same time! We’re actually hoping to head back to Vietnam this year and we’re planning on heading to the Mekong Delta so we’ll check out that homestay option thanks! And as for those tunnels, they were truly awful conditions and we were just as shocked as you by it all. Won’t be heading back there.